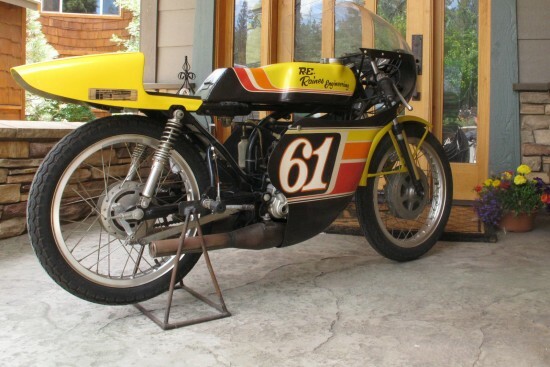 After Yamaha withdrew official support for the 125 class in the late 1960’s, serious racers were left in the lurch. If you wanted to go racing on a small Yamaha, you went out and bought a roadgoing YAS1 or an AS2. Then you purchased one of Yamaha’s GYT [“Genuine Yamaha Tuning”] kits that included carbs, heads, an upgraded clutch, exhausts with expansion-chambers, and a variety of sprockets to suit different tracks, installed it all, then took your modified streetbike to the track! 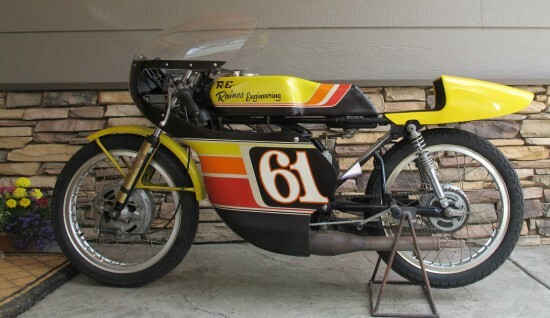 Built from1971-1975 the Yamaha TA125 was a production roadracing machine for sale to the general public. 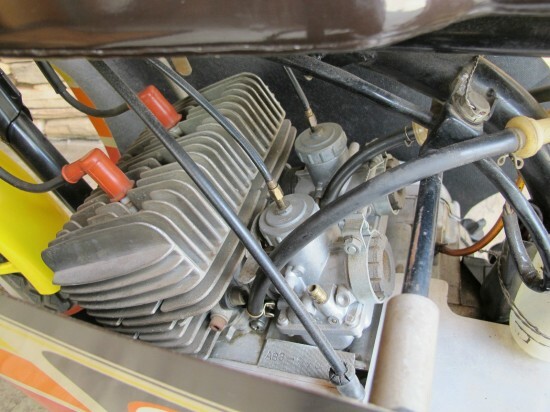 Although it was clearly a track-only bike, Yamaha did not put the effort into this machine that they did with their larger 250 and 350 racing motorcycles, and quality of components and the overall package was somewhat lacking in comparison: although this may have been a pure racing machine, it shared many parts with the AS3 on which it was based, and performance suffered as a result. But that shouldn’t really matter in this case. This one still features period tech-inspection stickers and is clearly a bike for collectors, not racers: it would require significant time and resources to make it track-worthy, and that custom-painted bodywork would be a shame to mess up. In addition, these weren’t really the best of the breed, and their street origins showed. Track-rats are better off sniffing around elsewhere. I purchased three bikes from a fellow who was closing his machine shop several years ago. Three bikes were stored in the rafters of his shop on a pallet, if I wanted one I had to buy all three. I sold the Penton to a collector strait away as I wanted the TA 125’s. 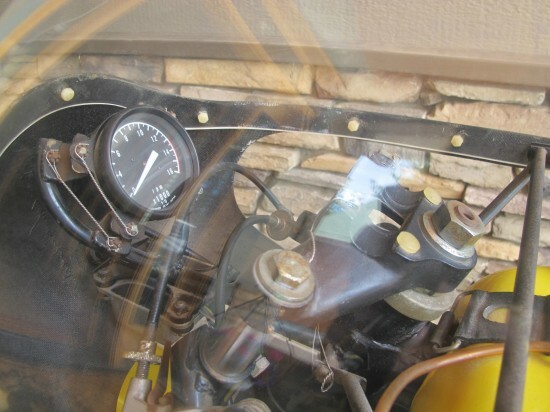 The bike I am now offering has not been restored, I cleaned it up and checked the timing, put some fresh pre-mix in the tank and started it up. We gave it a blast down the road and then put it up. I drained the tank and carbs and left the oil in the trans. So there you have it, an un restored roadracer with AFM tech inspection stickers still on it. You will no doubt note several modifications to the bike, they were done by the original owner back in the day. I have not modified any part of the bike, I respected the bike’s patina. You will note this is a no reserve auction, the bike is for sale. 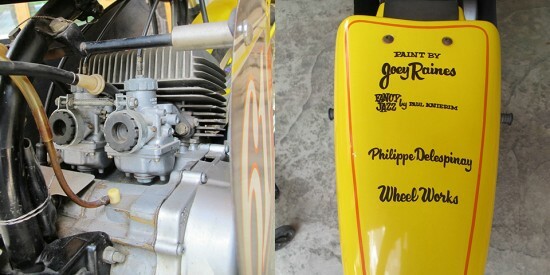 Have fun bidding on this rather rare bike. A very cool motorcycle with tons of patina and vintage details, it’d be a shame to do anything to mess it up or change it in any way, although I think personally, I’d probably want to get it to run at least, just to ride up an down the street and hear its little buzzsaw snarl. I am regular visitor, how are you everybody? This pot posted att this web page is truly nice.